Joseph Freeland, Kathy McCord and Lois Freeland pose for a photo at the Freeland residence in Rossville, Ga., Wednesday, Nov. 22, 2017. McCord received help from the Chattanooga Times Free Press Neediest Cases fund to assist with her rent after a house fire. Kathy McCord sat on the living room couch at her Rossville home and watched as her granddaughter, Harper, dumped a large box of toys onto the floor. Harper, just shy of 2 years old, shouted "Whoa!" and picked up a few toys with which to play, including a pink Jeep and a purple baby doll. McCord, 51, and her parents, Lois and Joe Freeland, are thankful this holiday season to have a home where the young girl can visit and play, they said. 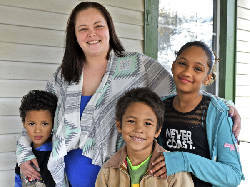 With help from the Times Free Press Neediest Cases Fund, McCord and her parents were able to move back into their home after a fire left extensive damage just six months earlier. "We would be on the street," McCord said. "We didn't know where we were going next." The family received $860 from the fund for rent. The annual charity appeal, started by Chattanooga Times Publisher Adolph Ochs in 1914 and continued by the Times Free Press, helps those with financial needs by providing a one-time donation. Readers can donate to the fund, which is administered by the United Way of Greater Chattanooga. "Ms. McCord's story is one of truly unfortunate circumstances and unforeseen tragedy occurring to her property," said Cary Bayless, development and marketing director for Family Promise of Greater Chattanooga. Bayless said McCord has been one of the agency's most grateful clients. "She was brought to tears when she received the check," he said. McCord and her parents had no renters insurance when their neighbor's fridge exploded the day before Easter and the fire jumped to their house. They had to turn to the American Red Cross and other local agencies directly after to find temporary housing and to meet their basic needs while their rental home was being repaired. When it came time to move back into their rental in October, the family still had a hard time coming up with rent because McCord lost her job in the aftermath of the fire. Relying on her parent's Social Security for now, McCord said she has applied for several jobs with no luck. The woman pointed to the bare Christmas tree set up next to the front door with no presents underneath. Through tears, McCord said it will be hard buying presents for all of her grandchildren this year, but she knows other families have needs just like them. The family said they appreciate the help they have received to help them get back on their feet. "The stress and mindset the fire put us in — it was such an emotional time," said Lois McCord said. "We are just grateful."